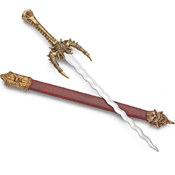 functional sword letter openers for deck and display. 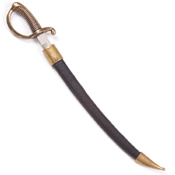 Boarding Cutlass Letter Opener With Scabbard: Classic simulated gold letter opener with detailed matching Scabbards. 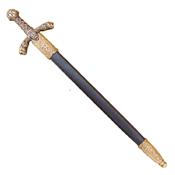 Length: 13"
Claymore Letter Opener: Letter openers have plated decorator blades which cannot be sharpened. 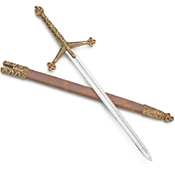 Length: 10.5"
Claymore Letter Opener With Scabbard: Classic simulated gold letter openers with detailed matching Scabbards. 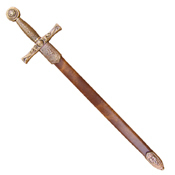 Length: 12.5"
Excalibur Letter Opener with Scabbard: Classic simulated gold letter openers with detailed matching Scabbards. 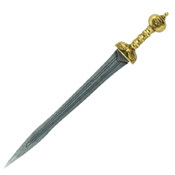 Length: 11"
Fantasy Letter Opener With Scabbard: Classic simulated gold letter openers with detailed matching Scabbards. 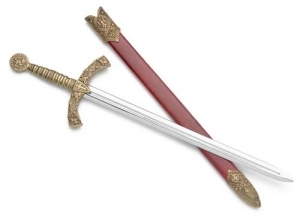 Length: 11"
Gladiator Sword Letter Opener: Letter opener has plated decorator blades which cannot be sharpened. 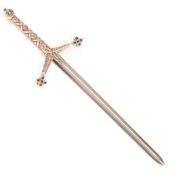 Length: 10"
King Richard Letter Opener With Scabbard: Classic simulated gold letter openers with detailed matching Scabbards. 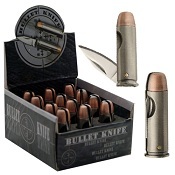 Length: 11"